The eighth course for this year's White Truffle Dinner was Pear Cake with Pain D'Epice Crème & Brown Butter Ice Cream. Whenever I order a tasting menu out at a restaurant, I'm always struck by what a difficult challenge the pastry chef faces. Whereas the executive chef has six or more courses through which to impress diners (with each dish hopefully surpassing the one before), the pastry chef is lucky to have two. Moreover, the pastry chef has to continue the upward trajectory set by the savory courses; after all, there's nothing more disappointing than a spectacular meal that fizzles out into a pool of mediocre desserts. Finally, it falls on the pastry chef to make sure that the final note on which the meal closes, the one diners will have most prominently in mind when leaving the restaurant, is an outstanding one. All of these thoughts weigh heavily on my mind whenever I plan a menu, and I always come out of the process with an even deeper respect for what pastry chefs have to do on a regular basis. The dessert course that we presented at this year's White Truffle Dinner was inspired by two of the best desserts that I tasted during the past year. The first, and more recent, was from William Werner -- Pastry Chef for both the Ritz-Carlton Half Moon Bay and its flagship restaurant Navio. As I described here a few months ago, Werner nearly stole the show during the Four Star Grand Cru Wine Dinner held at the hotel last October, serving up one innovative and delicious confection after another. Included among these was French Butter Pear Nage with Pain D'Epice Ice Cream and Creme Fraiche, comprised of individually delicious flavors that together achieved an almost magical result. Yes, Werner truly left an indelible impression on me that evening, one that I knew would have to be reflected on this year's truffle menu. The other influence for Course 8 came from Boris Portnoy, presently the Pastry Chef at Campton Place. In an earlier stint at the now-shuttered Winterland, Portnoy served one of the most delicious desserts that I have ever had: Caramelized Brioche. A small piece of delicious brioche from Bay Bread was soaked in creme anglaise and baked, after which it was dusted with sugar and torched to create a caramelized surface. Served on the side was the most incredible ice cream, one made from -- of all things -- brown butter. Now, if you've been reading the earlier posts in this series, you know about my great affinity for brown butter and the fact that I've used it for four straight years now in conjunction with the risotto of Course 5. But it had never occurred to me to try it in a dessert, and my first taste of Portnoy's creation in the opening months of 2006 simply astonished me. I wasn't alone in this reaction; there was extensive discussion on Chowhound about the dessert and how it might be replicated, until somebody from the restaurant finally appeared and posted the recipe for all to see. Portnoy's clever use of brown butter was thus another concept that demanded some sort of acknowledgement on my menu. Once I had identified the motivating factors, the flavors that I should incorporate into Course 8 became self-evident: gingerbread, pear, and brown butter. Coincidentally, the first two of these had been featured prominently in the dessert course from last year's White Truffle Dinner -- i.e., Gingerbread Cake with Poached Anjou Pear and Crème Anglaise. Because I enjoy forcing myself to devise a new dessert for each truffle dinner, I was generally opposed to using a straight repeat of any of the components from last year's dish. Yet, I was not against exploring variations on the flavor combination that I had employed there, nor was I averse to repeating the concept of a dessert anchored by a small cake. But which of my three flavors should go into the cake? And how would I get the other two into the dish? I decided to take a step back and approach this from a different direction. One easy component to use would be ice cream, and what better way to pay tribute to Portnoy than to include his brown butter ice cream exactly according to his recipe. One flavor down, and two to go. Gingerbread could not go into the cake if I wanted to avoid a repeat, so that left only one viable option: pear cake. My thought was to puree some Bartlett pears and then add them to a standard batter, perhaps even sauteeing the pears initially in butter and brown sugar to deepen the flavor of the finished cake. I conducted some experiments and was satisfied with the outcome. 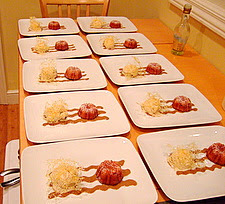 Once the pear cakes were in place, a gingerbread custard sauce struck me as a nice accompaniment. I pulled out the cake recipe that I used last year, identified the precise ratios among the ingredients that give gingerbread its distinctive flavor, and then calculated the amount of these ingredients to use per unit volume of custard. My first test batch tasted like gingerbread, but the molasses was overwhelming to the point of distraction. In penciling out the numbers for the second batch, I found myself reluctant to reduce the amount of cinnamon, cloves and ginger from their already low levels. But if I reduced only the molasses, would the overall flavor balance be thrown out of whack? I took a leap of faith and tried it, and I was pleasantly surprised to find out that the sauce tasted exactly as I had hoped. In talking to Rhonda the next day about my plans for the final course, we concluded that there was a texture missing. Specifically, something crisp or crunchy would go a long way toward rounding out the dish, while also keeping our diners interested. After considering brittles, pralines, toffees and wafers, I remembered something that I'd been wanting to explore for as long as I could recall: caramelized sugar decorations. For years, I had marveled at what professional pastry chefs could achieve with melted sugar, but I had never figured out exactly how it was done. After digging around online, I set a pot of sugar and water over a high flame and was on my way. When the temperature of the mixture edged over 300 degrees and its color had reached a deep amber, I plunged the pot into an ice bath for 10 seconds and then began drizzling the liquefied sugar onto Silpat using the tines of a fork. I was actually surprised at how easy -- and fun -- this was, and how even the most haphazardly-deposited lines yielded something that looked like it had been designed by the most talented of artists. I figured that I could put a small piece of this sugar creation on top of the brown butter ice cream in my dessert, giving the dish a decorative flair that would also provide the desired textural contrast. All of the components of Course 8 could be made in advance of the dinner, and that's exactly what we did. When the time came, we merely placed some gingerbread sauce on the bottom of each plate, positioned a pear cake on top, added a small scoop of brown butter ice cream, and finished with a piece of the caramelized sugar decoration. Wow! Wow! what a great meal! This entire dinner looks magnificent. I've been following along with these posts since the first White Truffle post, and it's been a pleasure to read. Thanks so much for sharing in such great detail the evolution of these courses over time, as well as your thought process in putting together a cohesive meal. Kat: Thank you, and thanks for all of your comments on the posts in this series! Eric: Thanks for reading along, and thank you very much for your kind comment. It's always great to get feedback from readers, and it's particularly gratifying to hear that somebody found the information conveyed to be interesting or informative. Cindy: Thanks for reading along, and thanks for the comment. You're absolutely correct about there being a lot of dishes: 8 courses, times at least 1 dish and 1-2 utensils per course, times 10 guests. Add to that the innumerable pots, pans, baking sheets, trays, Gladware containers, cooking utensils, and wine glasses, and my kitchen was a complete and utter disaster. One of my guests told me when she arrived that she was thinking about bringing a dishwasher (as in a person) as a host gift, which come to think of it, would have been an enormous help! We didn't have the energy to tackle the dishes the night of the dinner, but Rhonda and I got to work early the next day and got everything rinsed off and ready to go into the dishwasher -- which then ran seemingly nonstop for the next several days! Shuna: I hadn't realized that financiers use brown butter -- I guess I really need to get out and bake more often. Incidentally, I read about the Brown-Butter Buttered Pecan Ice Cream that you offered at Aziza, and I'm so sorry to have missed it. It sounds fantastic!